Nest, nest, nest, nest, nest, nest, nest. Indulgent, productively indulgent nurturing feelings flowing within. :) It's coming out looking like apple yeast bread. Oh, my lucky children. It starts here in the past. The adjustments included using half the recipe. In the divided recipe amount bumping up the salt to 1 1/4 tsp., less on the vanilla to 1 tsp., 1/2 c. whole wheat flour and 3 1/2 c. white flour, nix the spices. This is being linked to the wonderful website Yeastspotting. 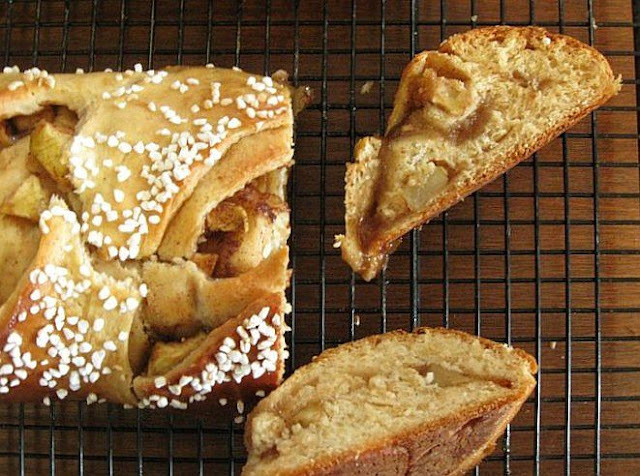 Use the above link to the cardamom bread with the noted adjustments. This will make two rolls. Apples of your choice, approximately three cups diced. 1 1/2 tsp. cinnamon - more or less to your taste. Add half the mix to the apples in a mixing bowl and toss. Set aside for a short time. If you let it sit long it will start to juice from the sugar. That is going to happen during the rise time anyway, I just don't want to roll it while wet. Roll the dough to 12" x 16". Spread the dough with melted butter. Sprinkle the one dough with half the remaining brown sugar. Sprinkle out half the apples. Roll, seal, let rise for 30 minutes. The apples will weep the sugar mixture. This is the time to preheat the oven to 375-400 degrees. Brush with an egg wash before putting in the oven. Sprinkle with optional sugar. Then make cuts. I baked these at 400 degrees for 35 minutes. I believe it would have been better to bake at 375 for 50+ minutes. The apples will make the inside layers to be moist. If the bread is not cooked all the way, it will be undone and doughy. So...better a little longer than not. Such harmonious loaves... 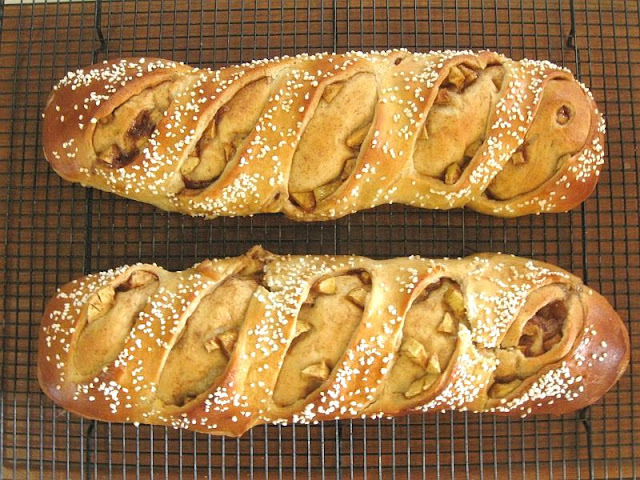 Your capacity for patience and letting go shines through in these lovely breads. I like the tantalizing glimpse of the apples through the little windows.